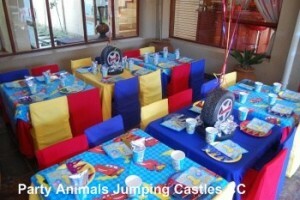 We are proud to be able to supply our kids linen in a wide variety of colours and themes. 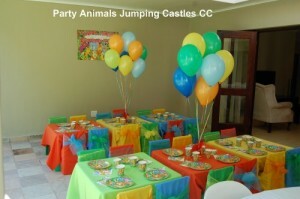 We normally do themed overlays on a plain coloured table cloth that compliments the overlay and the chair covers in a plain colour rounded off with a tie back, flower, butterfly wings or helium balloons. All our tie backs are made from organza and available in a wide range of colours. We take pride in our linen and want to supply you with the best quality clean and neat linen. Sadly we have to charge a holding deposit on our linen as we do not always get it back in the same condition we rented it out. Linen must be returned clean and all stains removed. Any damages will be charged for. Holding deposits will be refunded 100% is there is no damage to the linen. 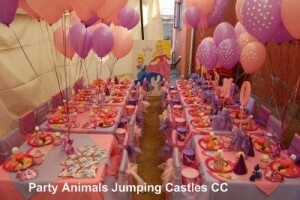 Please NEVER place any candles, oily food or paints on the table and chair covers. Please arrange with the office for plastic covers to protect the linen if you are going to have paint, art or any other form of entertainment that might spoil the linen. 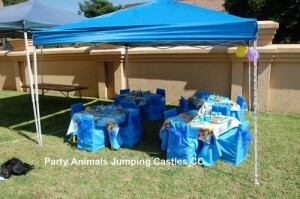 Linen can be rented in sets – 1 table cloth, 1 overlay, 4 chair covers and 4 tie backs, or loosely as required. 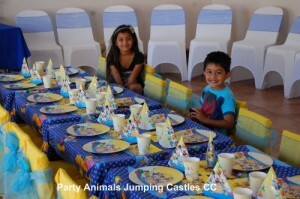 Party Animals Jumping Castles also provides the option for us to do the complete party setup if required. No additional fee is charged, but this needs to be arranged when placing the booking. 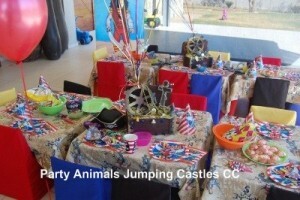 As seen from the setups below, we do supply all party accessories as well.